1) R is for RULES- Play by the rules of the game, because the rules are what allow us to keep the game fair. Breaking the rules dishonors the game, even if it means we win. 2) O is for OPPONENTS- Without opponents we could have no game. A good opponent makes us do our best. Respect all opponents. 3) O is for OFFICIALS- Officials have been selected and trained to enforce rules and they have a very hard job. Without officials the game would be unsafe and unfair. Officials are not perfect and sometimes make mistakes. Never complain about an official’s call, even when you disagree with it. Respect officials at all times. 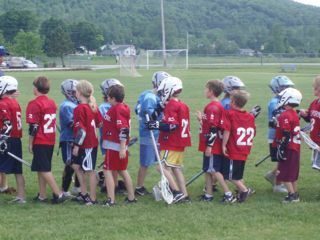 4) T is for TEAMMATES- A big part of lacrosse is being on a team. Show commitment to your teammates by playing as hard as you can at practices and games and making an effort to improve lacrosse skills. Be on time for practice and do not participate in mischievous behavior. Additionally, encourage and support each other on and off the playing field. Make positive comments to build up the confidence of other players. Furthermore, treat all coaches with respect. fans do. We live up to our own standards because we have so much respect for ourselves that we would never do anything to dishonor the game. Part of our own standards are to WIN GRACIOUSLY and to LOSE WITH DIGNITY.